So I've been MIA from the social set for several months. My daughter was home from college for the summer and I spent a lot of time with her. We gave a free writer's workshop at the local library, and just hung out talking about stories and writing. Different ideas have been formulating in my head since school started again. The first is writing the second Highland book. Highland Stone was my debut novel all those years ago. I loved getting to know the MacLeod clan and the time travel was exciting for me to write. Many people asked for Ramsey MacLaren's story and I've finally decided to write it. I'm going to put up posts now and again regarding the process of writing the book. The first step was how to make the story a time travel. Since the first book was a time travel, I wanted to stay in the same romance genre. My critique partners and I (the Sassy Scribes) put our heads together and started brainstorming ideas of what would make a good time travel story for Ramsey MacLaren. In Highland Stone you see that Ramsey is a kind of tortured soul. You know from Alaxandar that things had happened to MacLaren--awful things that even he didn't know. You get different glimpses of Ramsey. He is the one Alaxandar goes to when he needs to know what the English King is up to, and when he needs information. Ramsey has friends in low places and high places, and can get information. Then since I write romance, there obviously has to be a love interest. 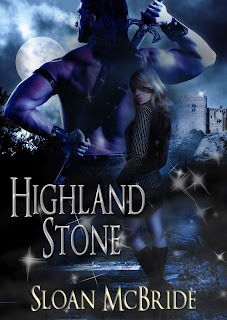 In Highland Stone you find out that Alaxandar's sister, Leelah, has her sights set on Ramsey MacLaren even though Ramsey wants nothing to do with it. She's a MacLeod and doesn't give up easily. Back to the time travel aspect. In Highland Stone the catalyst for the time travel was a clan stone, a talisman. In this book the same stone will be used for the time travel purposes. In this book, you will get to see some of what happened to Ramsey which turned him in to the man you see today (relatively speaking). You will see what he endured, how he escaped, and what promises he made. I put the writing on hold until after October. With the workshop over the summer, my daughter being home, and then researching, writing, and giving a month-long online workshop about audiobooks, I figured it would do no good to try and write the book with all those other obligations hanging over me. My daughter is back at college, my day job is changing (yet again) for the better (for me), and the online workshop is basically done. Except for handing out candy Monday night for the little ghosts and ghouls, I'm ready to begin. Now just because I haven't been writing yet, doesn't mean I haven't been thinking non-stop about the characterization, the plot, the everything. I'm excited to get started.